Geneva/Switzerland, September 2012 – – Harmonic Drive AG of Limburg, Germany, has developed an inventive type of component gear set, used in industrial service robots, medical technology, aerospace and semi-conductor manufacturing, that is considerably lighter and more compact than conventional gears, yet can deliver higher torque and achieve a reduction ratio range from 30:1 to 320:1 in just a single stage without backlash. The company specified DuPont™ Vespel® TP thermoplastic bearing cages to play a key role in achieving low weight and compactness in its Harmonic Drive® CPL component sets. These wear-resistant Vespel® TP parts offer a low coefficient of friction against steel with good mechanical strength and toughness. They help ensure the lightweight, compact component sets operate reliably even at very high or low temperatures. 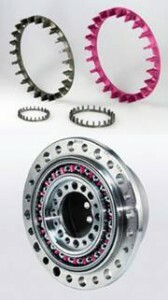 Working closely with DuPont, Harmonic Drive AG developed the Vespel® TP bearing cages specifically for applications requiring superior resistance to aggressive, high performance lubricants at high temperatures, or the ability to operate in a vacuum — performance beyond that of cages made from standard engineering plastics. The Vespel® TP bearing cages resist additive-enhanced greases and oils used to provide lifetime lubrication (approx. 30 000 hours), at ambient temperatures between –40°C and 120 °C. “Depending on the application, the forces transmitted from the ball bearings can induce high flexural stress into the cage clips, particularly during start-up, a change in speed, or a reverse in rotational direction. In light of the minimized wall thickness, extreme load cases can lead to premature cage clip wear or breakage in cages made from standard engineering polymers. In comparison, Vespel® TP bearing cages have proved to be durable and reliable under such conditions, even in extreme operating environments,” said Dr. Matthias Mendel, design and development manager at Harmonic Drive. thermoplastics, providing broad design freedom and suitability for mass production. They offer an outstanding combination of mechanical strength, chemical resistance to common fuels and lubricants, as well as a high continuous operating temperature with minimal out-gassing in vacuum environments. Other typical applications include journal bearings and sliding components, guide bushings and thrust washers. The Vespel® TP parts used in Harmonic Drive® gear units withstand high mechanical loads due to the material’s high flexural strength (215 MPa @ 23°C), high dimensional stability, exceptional creep resistance, and allow service at continuous operating temperatures up to 244°C (HDT). DuPont offers a variety of high performance polymer (predominantly polyimide) based Vespel® parts and shapes in thermoplastic TP and thermoset S product families, among others, with numerous grades in each product family that offer an optimum material solution for the specific demanding application.